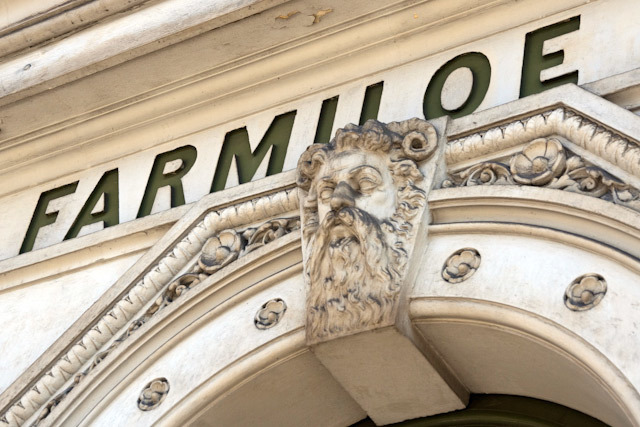 The Farmiloe building - look out for it next time you're near Smithfield Market. 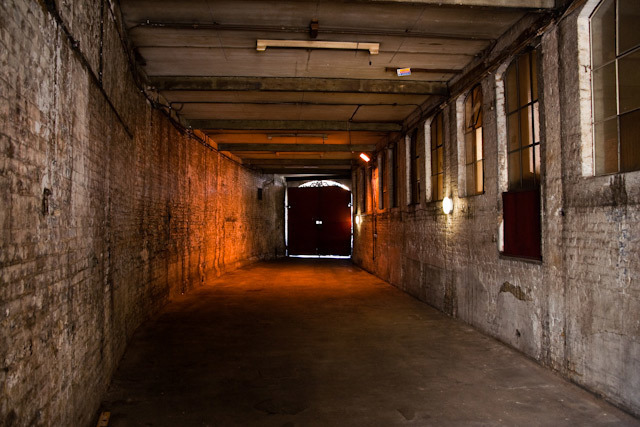 The long passage leading from the road to the main warehouse space. 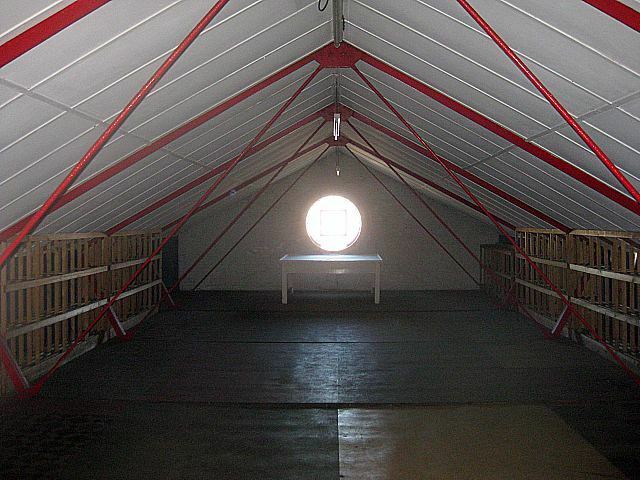 One of the upper floors: perfect for tied-up hostage scenes. 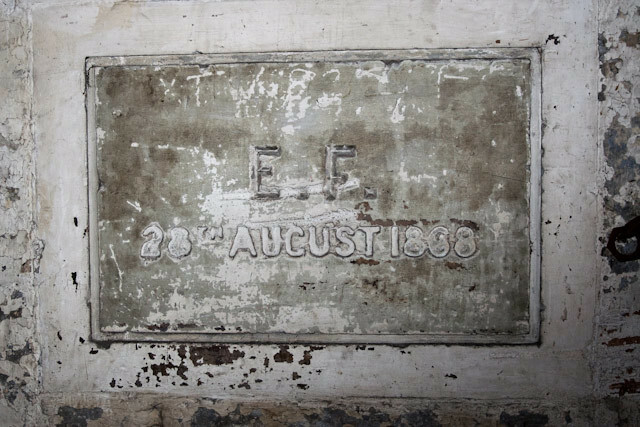 An old plaque near the front entrance marks the foundation date: 1868. Every floor has a strange cluster of safes. 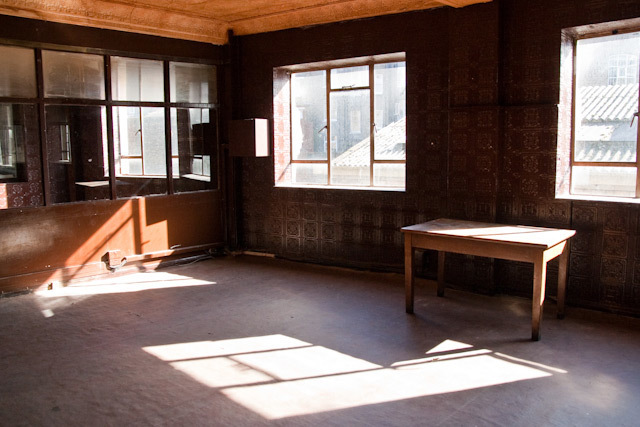 At the front of the building, a wooden-panelled office area has offered a ready-made stage set. Commissioner Gordon had a desk here. The company logo emblazoned on the stair way. 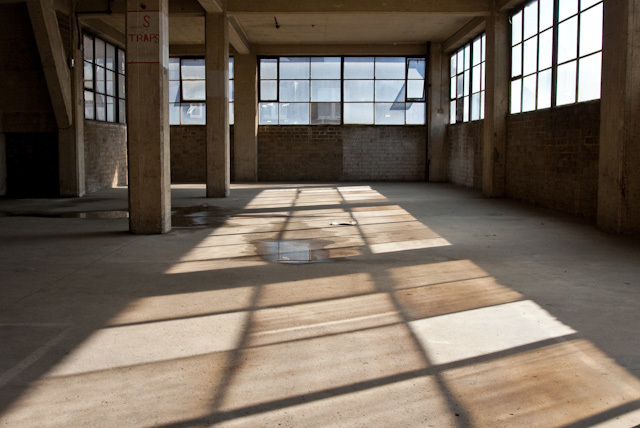 The back room at first-floor level was the scene of the Joker's explosive escape from the Gotham City police in The Dark Knight. 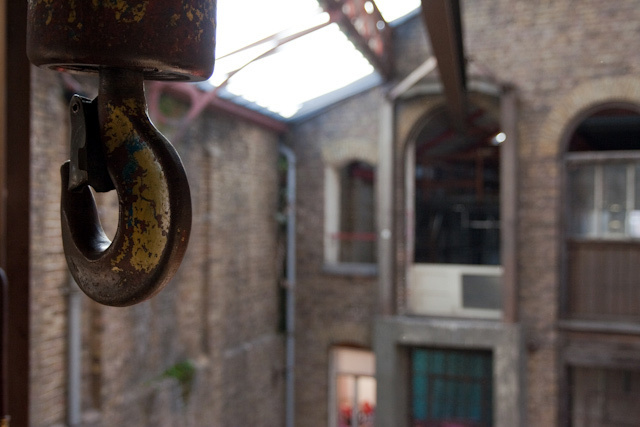 A sturdy hook on a pulley rail almost looks like movie clichÃ©, but is a genuine feature. The very top floor has an unusual postmodern flavour to it. That porthole at the end looks out onto Charterhouse. Chances are you've never noticed the Farmiloe Building. 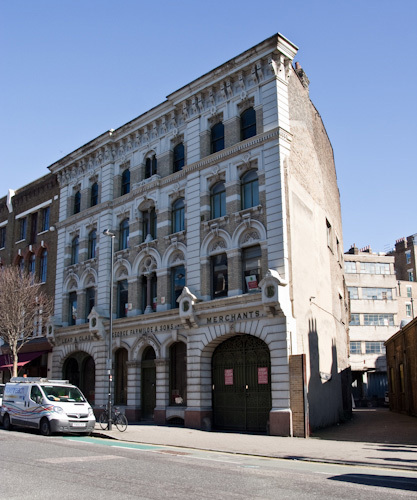 Its frontage on the Smithfield end of St John Street is typical of any ornate Victorian warehouse building in this area. But step inside and you're in a different world. The whole edifice is one giant film set. Batman's been here. The first floor doubled as Gotham City police headquarters in the past two films. The Joker's been here too, blowing out the back windows during his escape from police custody in The Dark Knight. Sherlock Holmes has sleuthed here. Robert Downey Jr and Jude Law rescued a flailing Irene Adler from a date with an abattoir buzz saw on the lower levels. Poirot and Marple have both gone about their rather more sedate investigations within these walls. 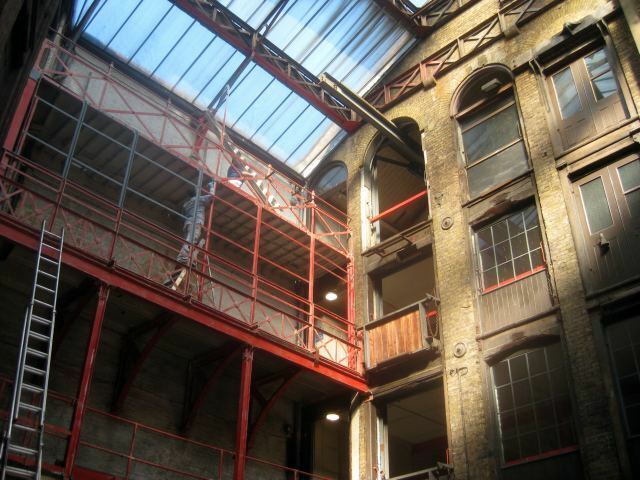 And another major film was preparing to shoot as we were shown around this exceptional building. 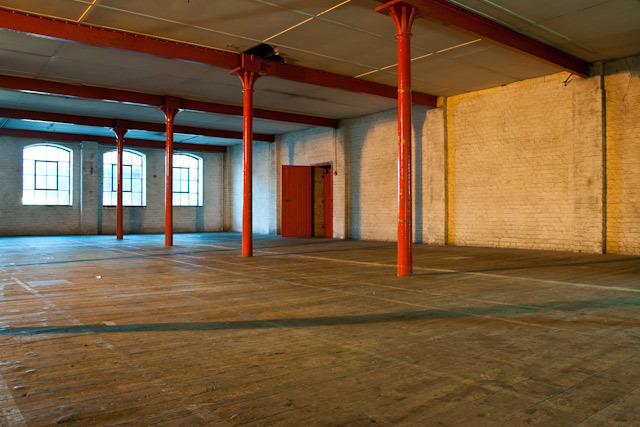 The warehouse dates from 1868 and was for over a century home to George Farmiloe & Sons, a sheet lead and glass manufacturer turned furniture purveyor (check out an hilarious account of one guy's dreadful two years working here). Since 1999, the building has stood largely empty. 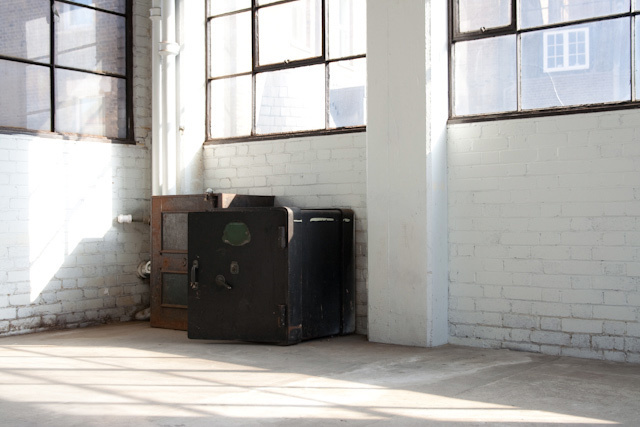 But with floors decked out in so many different styles, it's become something of a magnet for film makers. There's also a small resident population: the second floor has a few tiny apartments for Guardians to rent out cheaply in exchange for looking after the building. Click through the gallery above for descriptions of the interiors. With thanks to Itasca Locations for arranging the tour. Images by Dean Nicholas and M@ Brown.